British composer and producer Brian Eno, who openly supports BDS, orders Israeli dance company Batsheva to stop using his music. 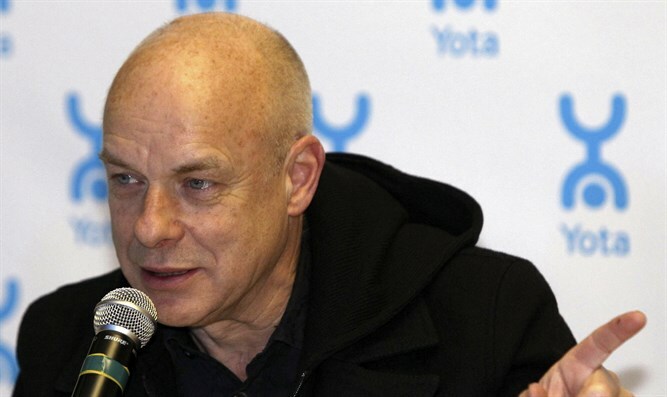 British composer and producer Brian Eno, a longtime supporter of the anti-Israel Boycott, Divestment and Sanctions (BDS) movement, has ordered an Israeli dance company to stop using his music, JTA reported Wednesday. The Batsheva company has been using an Eno composition in its dance routine titled "Humus" since 2013, the London-based Jewish Chronicle reported. It was scheduled to perform the routine this week at a dance festival in Italy. But Eno, who has produced albums by rock bands including U2, Coldplay and Talking Heads, called on the dance company not to use his composition at the festival after learning that the performance was sponsored by the Israeli Embassy, according to JTA. Eno was among the many British artists who signed the Artists Pledge for a cultural boycott of Israel that was launched in February 2015 by Artists for Palestine UK. In a letter to the dance company and its choreographer, Ohad Naharin, Eno said he was not aware until last week that Batsheva used his work. "(T)hough in one way I’m flattered that you chose my music for your work, I’m afraid it creates a serious conflict for me," he wrote, according to JTA. "To my understanding, the Israeli Embassy (and therefore the Israeli government) will be sponsoring the upcoming performances, and, given that I’ve been supporting the BDS campaign for several years now, this is an unacceptable prospect for me," added Eno. He condemned what he called "the demolition of Palestinian homes and confiscation of Palestinian land" and the lack of "any attempt to limit settler activity in any way." "I am trying to understand the difficulties that must face any Israeli artist now – and in particular ones like yourselves who have shown some sympathy to the Palestinian cause," he wrote. But the bottom line, Eno said in the letter, is "I don’t want my music to be licensed for any event sponsored by the Israeli Embassy." While Eno is actively boycotting the State of Israel, many artists in recent years have actually ignored calls by BDS to boycott the Jewish State and went ahead with performances in Israel. One example of an artist who did not cave to the BDS pressure is popular rhythm and blues artist Alicia Keys, who gave a sold out concert in Tel Aviv in 2013. The pop duo Pet Shop Boys also rejected calls from pro-Arab activists to cancel a Tel Aviv concert. The concert went ahead as scheduled. Many of the calls to boycott Israel have come from Roger Waters, the former Pink Floyd star who is notorious for his anti-Israel and anti-Semitic rants and has repeatedly condemned his colleagues who associate with Israel. Among others, he has called out Jon Bon Jovi, to whom he penned an open letter condemning his choice of performing in Israel and claiming he "had a chance to stand on the side of justice." Waters had previously called out Alan Parsons, the Rolling Stones, as well as Neil Young and actress Scarlett Johansson.